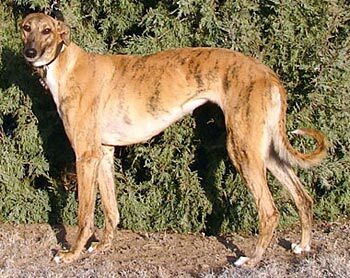 Angel is a 2½-year-old brindle female born October 25, 2008. Her sire is Mankato, and her dam is Bow Fast Draw. 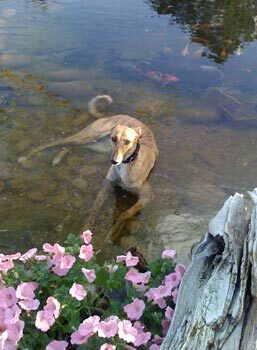 As the “C” pup in the litter, Angel was not individually registered with the National Greyhound Association. 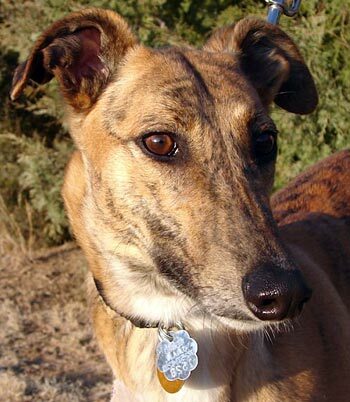 Angel arrived with 2 other greyhounds – Ray and Shadow – on March 3, 2010, from a coyote hunter in Amarillo. Angel had a large fresh wound on her right shoulder presumably from a hunt. 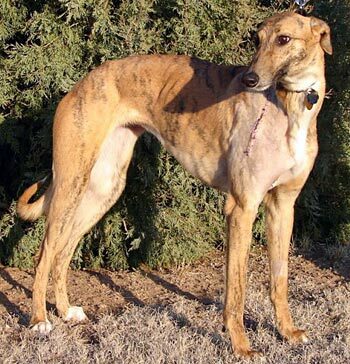 All greyhounds were immediately taken to Animal Medical Center in Amarillo where they received care from Dr. Wick Culp. Surgery was performed the next day on Angel, and this girl is all healed up and ready to find her forever home! Angel is cat and small animal tolerant. Angel is a sweet, loving, young, curious, friendly, outgoing and smart greyhound that loves toys and people. She is a collector deluxe and doesn't harm her prizes. Angel uses the doggie door and has not had an accident in the house or crate. She doesn't care for the crate for long periods of time, but that is where the speed eater has her dinner so the other hounds have a chance to eat theirs. Angel sleeps through the night on a dog bed in our bedroom. Angel is cat trainable and getting better everyday. She gets along well with all our hounds including the grumpy ones, and she is good with our old hounds also. Angel loves attention and draws a crowd wherever she goes. She will make an amazing companion pet for some lucky family.